Children are back in school, the air has a slight chill, the leaves are starting to change colour, there is no more denying that Fall is here. Warm up and embrace this beautiful time of the year by making this hearty soup. It’s thick, full of flavour, and doesn’t get its creamy texture from cream. Growing up, mashed squash as a side dish was one of my favourite vegetables, so I was surprised when both of my small children did not seem to like it. Although, they were not fussy eaters, they both begged not to eat squash. Through some food experimenting, it seemed it wasn’t the taste but the texture of mashed squash that didn’t appeal to them. Once I started roasting cubes squash instead of mashing and they said these “were good”. 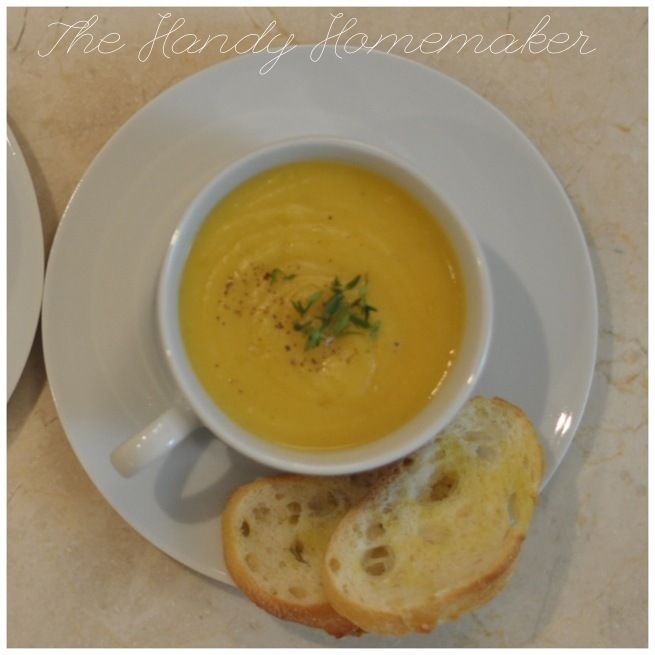 It wasn’t until I started making this Butternut squash soup, that they became fans though. 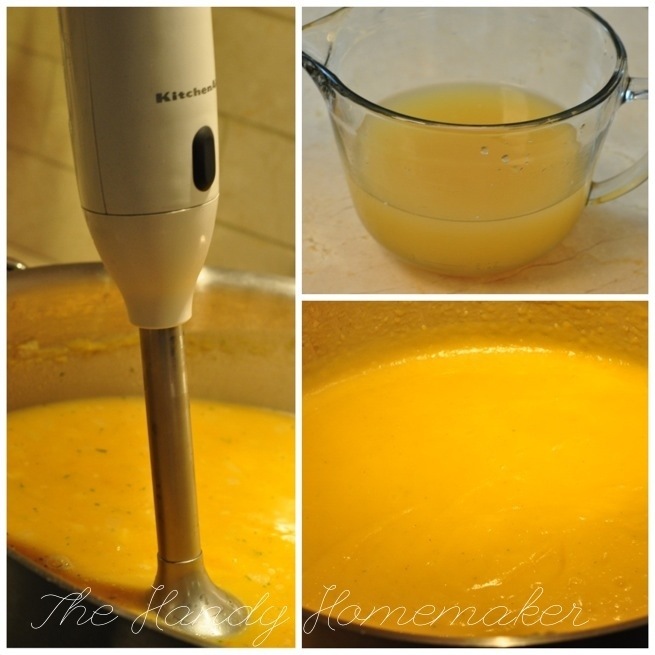 Squash soup is rich and thick however, adding 1 cup of non dairy milk ( I use almond) can add to the smooth silky texture of this soup. sheet of parchment paper for roasting the squash. 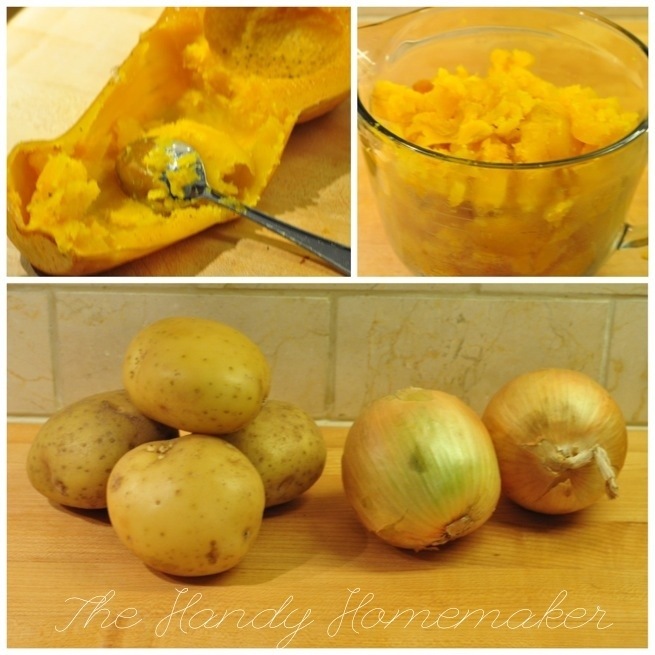 You can skip the roasting of the squash and just peel and cube the squash and add into your pot with the cubed potatoes. I make it this way occasionally and it tastes wonderful. I do think by roasting you get that rich caramelized and nutty flavour that roasting gives to the soup. Also, peeling squash can be difficult, and by roasting the squash just needs to be scooped from the peel once slightly cooled. Other versions and substitutes for squash soup..
No squash on hand… Did you know that pumpkin puree can be used as a substitute for squash? Just make sure it is plain pumpkin puree and not pumpkin pie filling. Replace just the squash for pumpkin, or edit a few more ingredients and you have another soup recipe in your cooking arsenal. Make this soup using the same steps as below. 1. 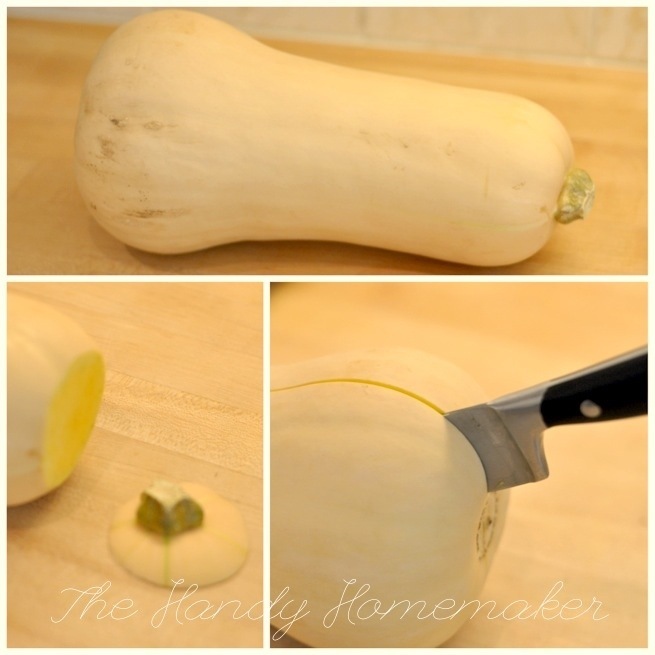 Cut off the stem of the squash and cut carefully down the middle. 2. Scrape out the seeds and pulp of the squash. 3. Season lightly with sea salt and pepper and place cut side down on a baking pan covered with a sheet of parchment paper. You can put olive oil in the pan if you do not have parchment paper. 5. 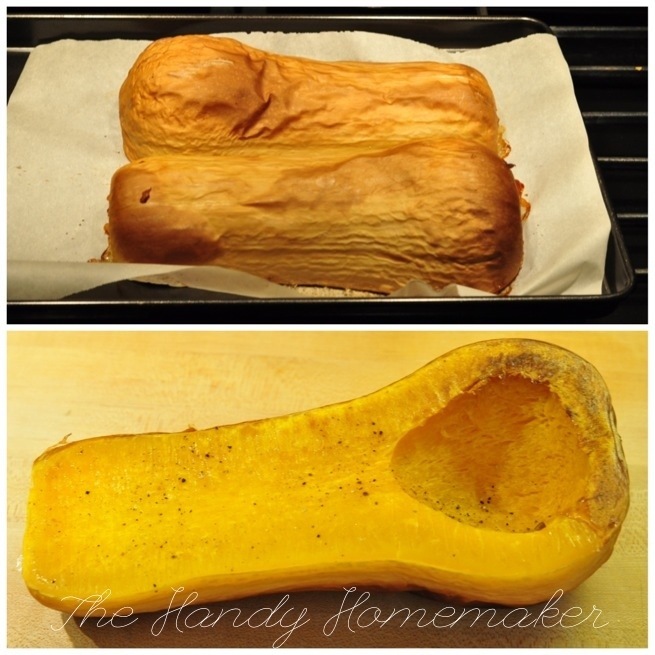 Remove cooled squash with a spoon and set aside. Don’t worry if your squash only gave you 3 or 3.5 cups. That will still work in this recipe. 6. 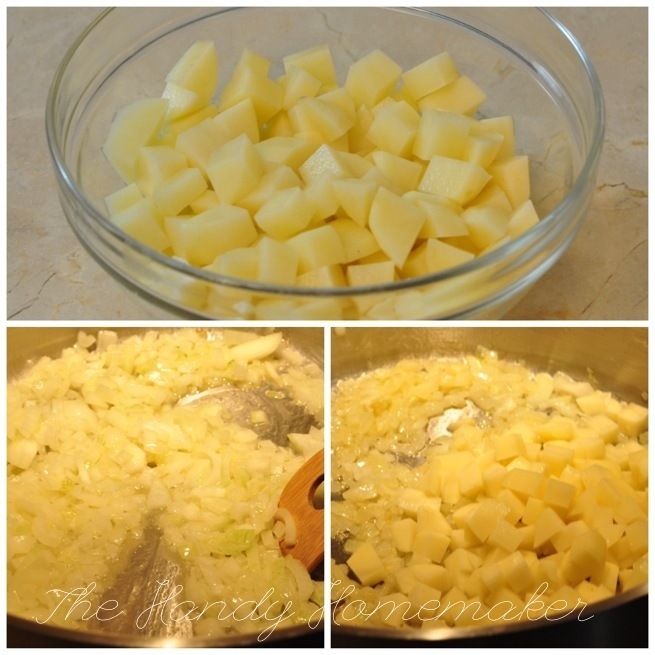 Peel and finely chop onions, peel and cube potatoes. 7. 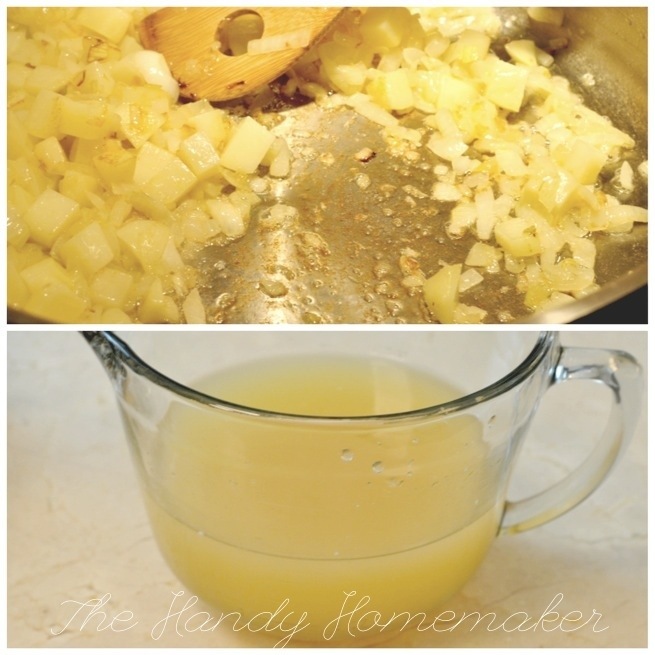 Add stock for sautéing to the pot over low-medium heat. 8. Add onions and potatoes to the pot and saute over medium-high heat for approx. 5 min. Cover until softened. This allows the flavours to brighten and adds a richness from the carmalizing of the onion juices setting on the pan. Add more stock as needed to prevent sticking. 9. Add 6 cups of the vegetable stock. 10. Add the roasted squash to the pot 11. Add the sea salt, fresh ground pepper, ginger, garlic, and nutmeg. Bring to a simmer, cover and continue cooking until potatoes are tender, 25-30 minutes 12. Remove from heat. At this point I add the the finely chopped thyme, and the remaining stock as required, depending on the thickness you may decide you need a little more or less. The soup will thicken quite a bit more once blended. I find this step helps cool the soup a little so that when you are blending you don’t have scorching hot liquid splattering on your arm. 14. Test for seasoning, you may want to add a little more salt, and/or pepper. 15. Scoop into bowls, garnish* with thyme, nutmeg, serve with crusty bread. If you do not have a hand immersion blender, you can use a countertop blender or food processor, by blending small batches of the soup. Cover the blender with a tea towel while doing so can help to keep the cover on if the steam is trying to pop it off. I would let the soup cool slightly longer before, then pour back into the pot and reheat to desired temperature for serving. If you don’t have any of those appliances or for that extra smooth soup you can press the soup through a sieve. Garnishes – I love to experiment with garnishing this soup. I have toasted or carmalized onions, walnuts, pecans, pine nuts, or pumpkin seeds and places on the top of the soup on their own or with thyme or chives. simply delicious! 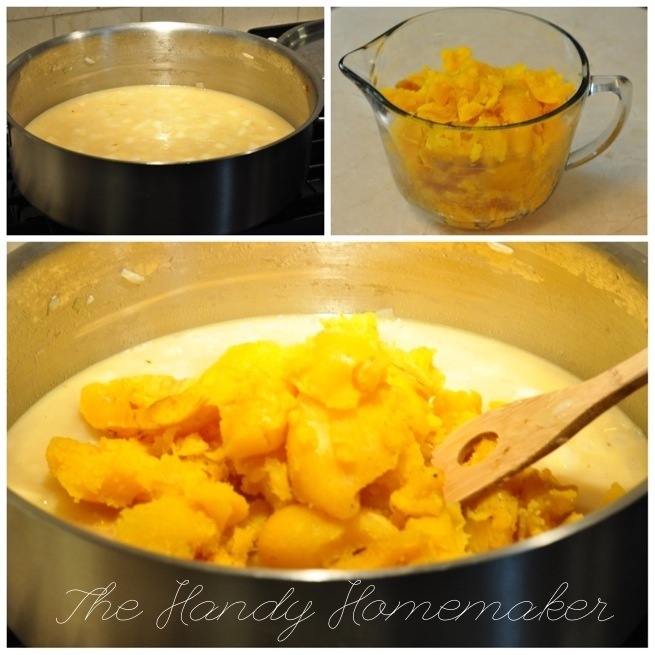 I added more butternut squash and less potatoes:) Thanks for sharing Mina…. Loving your blog! 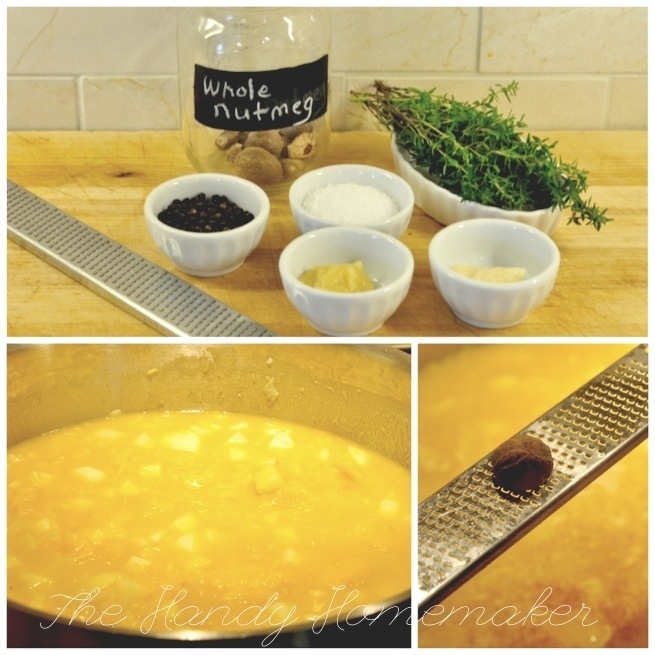 Going to try this soup tomorrow for kids- thanks for the recipe! Cooking as we speak! 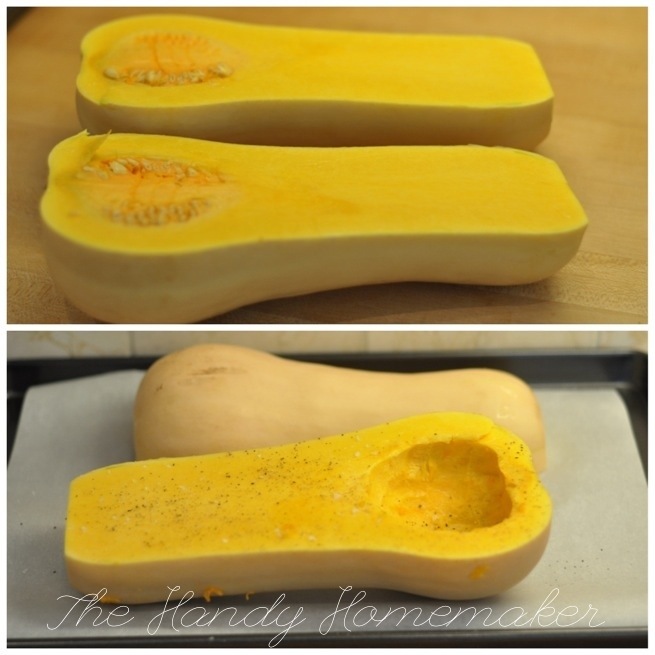 Accidentally picked up spaghetti squash instead of butternut though…trying with that and hope it turns out ok! Spagetti squash has a milder flavour than butternut squash and has a stringy texture but should puree just fine. I roast spagetti squash and use in place of pasta. 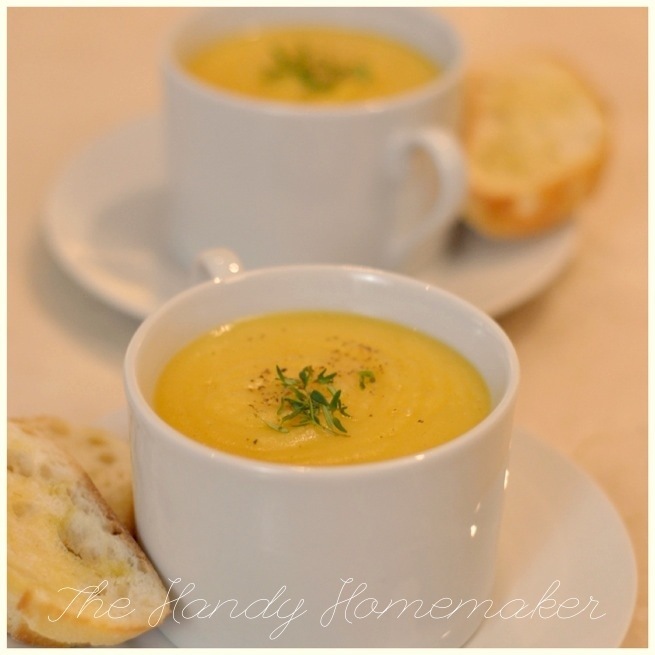 You could add a couple of carrots, or a sweet potato to heighten the flavour and color of the soup as well. Let me know how you make out.